For the last 10 years or more, the handicapping tournaments in the horse racing world have been all the rage. The popularity has increased with each passing year, and the overall tournament landscape has changed significantly. Whereas in the past nearly all contests featured a $2 win/place format using mythical money, the larger real-money tournaments have now taken over. The good news is that there is still something for everyone. There are small entry-level contests where the buy-in may be as a low as $9, and there are huge tournaments where you need $10,000 or more to get in the front door. Handicapping tournaments are a lot of fun, but to win one you have to be more than just a good handicapper. You have to be prepared and have a plan. Today we’ll look at the steps I believe you need in order to succeed in horse racing contests. Feel free to share your thoughts and experiences at the end on what you think it takes to win a handicapping tournament. Yes, that seems pretty obvious. But understanding the basic rules and really knowing the rules are two different things. There are many contests out there that have ‘fine details’ and those fine details can be the difference between winning and losing. I highly recommend reading through the rules of an upcoming contest multiple times. In doing so, you may just catch something you missed the first time around. For example, in 2016 I was fortunate to win into the Kentucky Derby Betting Championship, a brand new, real-money contest that featured a $20,000 buy-in. You had to bet a certain amount of money on a minimum number of Churchill Downs races on both Friday and Saturday of Kentucky Derby weekend. What could easily be missed in the rules is that you could wager LESS than the required amount on any given race. This omission was actually significant. Why? The reason being that you could take a swing at a race that maybe you didn’t want to go all-in on per the minimum race requirements. So, instead of wagering the required $400 minimum, for example, you could take a shot with $50-100 in bets. If you lost, no big deal. If you hit an exacta or trifecta that paid well, this could help you make a move on the leaderboard. If you sat out the race entirely, because you failed to understand the rule, and then a horse you were strongly considering won, this could also wreck havoc on your mental game. There are other contests where if you fail to make a bet or meet the minimum requirements, you’re disqualified. I’ve seen this happen even to veteran tournament players. By reading the rules and really understanding the ins and outs of the contest, you’re much less likely to make a critical mistake. In the week leading up to a contest that features specific tracks, you should definitely follow the action at those tracks in the days prior. There are several benefits to doing that. For one you may catch on to a prevailing track bias. You may notice certain trainers or jockeys that are ice cold, or red-hot for that matter. You may also notice a horse that was victorious who ran against a horse entered on the upcoming contest date. That happened to me many years ago when I was involved in a handicapping tournament in Kentucky. The day before the contest, I had wagered on a horse that won impressively at Keeneland and had done so at nice odds. The following day a runner that had been very competitive with that winning horse was entered to run. The horse made sense to me, for a variety of reasons, and I knew he was coming out of a sneaky good race. He crushed the field and scored at 50-1 odds! I had him in the contest and, although I didn’t win the grand prize, I was among the top finishers at the conclusion of the contest. I’m not suggesting that you just take stabs at big longshots. However, it is advisable to find some value plays that make sense and can propel you up the leaderboard if you’re right. Just a couple of victorious 6-1 shots can oftentimes put you in the hunt to win a tournament. If you’re playing a tournament with mandatory races, then everyone is required to play the same race(s). If a big price comes in, unless it’s a very small field of players, someone is going to have the longshot, and you’re toast. The chances of just picking the logical favorites and being successful in most tournaments is low, as this player found out a few years ago. In this live, online tournament featuring 10 mandatory races, there were 105 players and the top 12 won prizes. This player had an awesome day, selecting six winners in a row! The problem was that only one of those winners paid more than 2-1 and that was the 4-1 winning selection at Hawthorne. Unfortunately for this sharp handicapper, a big price came in late in the tournament and blew him and his great day out of the water. He plummeted to 15th place, out of the prize spots. 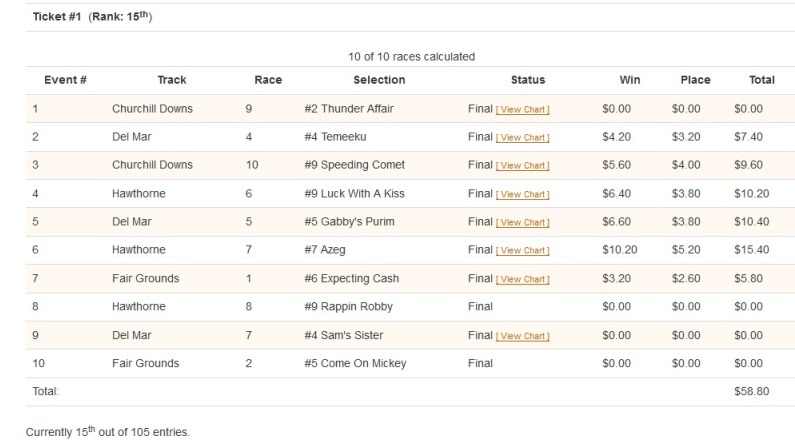 SIX winners in a row in a 10-race contest against only 104 other entries, and he finished completely out of the money. Incredible. When you enter a contest, whether it’s on-track or online, you should handicap and make your selections (or structure your wagers) as far in advance of the first race as possible. Then, check the scratches when they get posted and make appropriate revisions. If you enter a contest and just plan to ‘wing it’ at the event, or during the online contest, I wish you the best of luck. To me, one of the worst aspects of ‘winging’ a contest and playing it as it goes, is that you are not prepared for the later races. And, more times than not, the later races will play the biggest part in determining the final results. The other benefit of mapping our picks or wagers ahead of time is that you are more likely to stick to your guns. How many times have you heard a player say, “every time I change a pick, it loses,” or “I should have stuck with my original pick.” I can attest that when I change my original pick it is usually a mistake. It’s rare that I have a good reason to go against my original handicapping. Now, of course, if there is a sudden downpour and the track has become a muddy mess, that is one example where changing your picks is not only a good idea but probably advisable (assuming you didn’t handicap for a wet track). There are other scenarios and most are common sense. Where it is not advisable is when you hear the paddock commentator say something negative about your selection, and so now, you’re looking at going a different direction. Stick to your guns. If you put a lot of work into your original selections, don’t be easily swayed from them. Winning any handicapping tournament is not easy. Chances are you need to follow the advice presented herein and then proceed to have a really good day on top of that. In many big contests, you also may need to catch a few breaks, e.g. winning a photo, surviving an inquiry, etc. Winning is not easy, but if you lay the proper foundation, you enhance your chances greatly. Best of luck! Rich Nilsen is the founder of A Game of Skill. He is a 15-time qualifier to the National Horseplayers Championship (NHC) and a winner of 8 major handicapping tournaments. He is currently ranked 6th on the new NHC Lifetime Player Rankings system. Rich will be on the panel discussing handicapping tournaments at the Equestricon Conference in Louisville, KY.